The goal of the project is to develop real-time methods for motion generation of complex robot, able to cope with the complexity of humanoid and other legged robots in realistic industrial and medical environments. Exploration, during an offline phase, of the robot motion capabilities, in a various environments representing a sampling of the situations the robot will meet during operations, using motion planning methods (i.e. 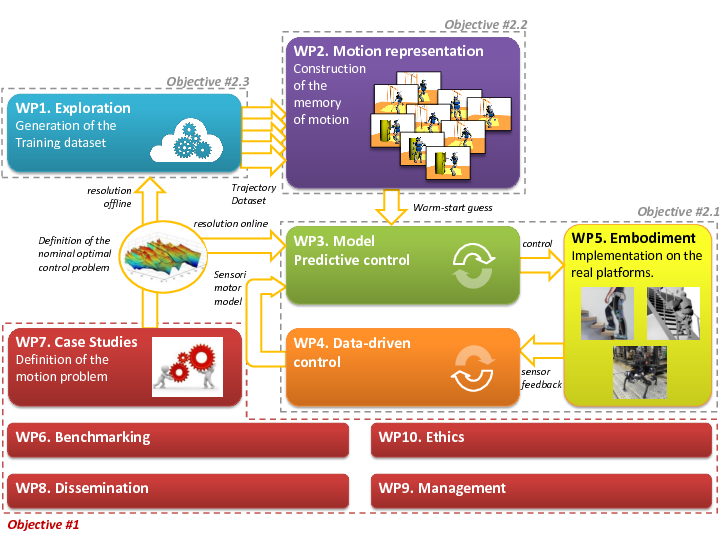 sample-based motion planning, RRT, etc). We expect that this exploration should lead to hundreds of Gigabits of robot trajectories in simulation. Encoding of the explored trajectories into a "memory of motion", using machine learnings methods. Control of the robot using a model-predictive controller, whose numerical optimizer will be warm-started using the memory of motion encoded during the offline phase. We will first develop state-feedback control strategies (following the main branch of predictive control) while also exploring learning methodologies to extend the control methodology toward sensor-based control.